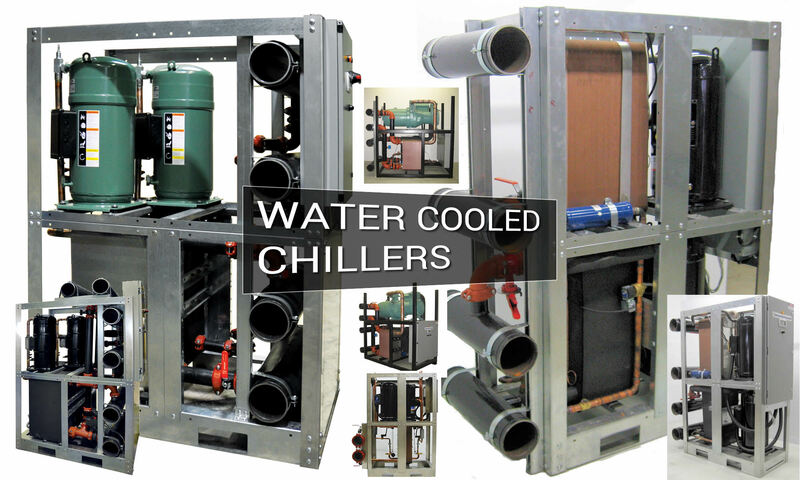 Tandem Chillers Inc. designs and manufactures water cooled chillers that are easy to install, easy to repair and easy on your wallet. The water cooled modular chiller is compact in size allowing for easy installation in hard to reach places where space is severely limited. 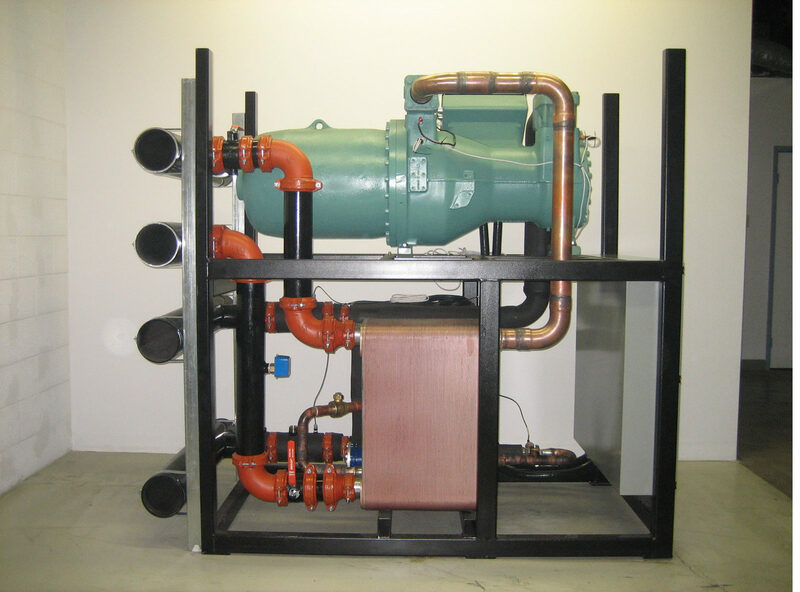 We also offer Dedicated Heat Reclaim SCROLL chillers with 410A Freon and SCREW compressor chillers with 134a Freon both with high leaving water temperatures up to 145° F.
We offer ultra high condensing temperature water cooled scroll/screw chillers available with only freon 134A up to 150° F leaving water temperature. Also see our Heat Pumps – Water to Water Heat Pumps and our new Service-In-Place Chillers. 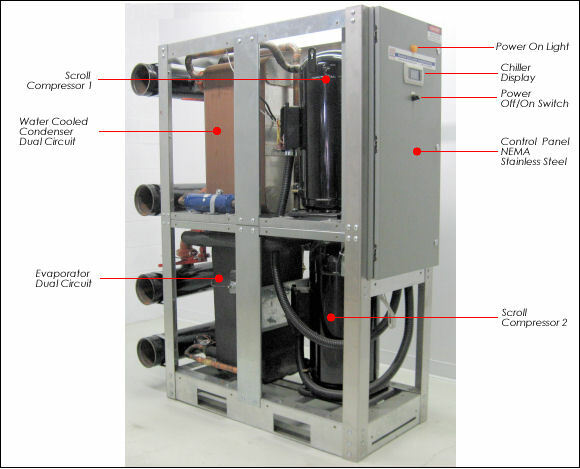 The most impressive thing about our water cooled “service-in-place”chillers is the ability for you to do maintenance and repairs without shutting down the rest of the system. This saves you the extra expense of purchasing extra chillers for stand-by. 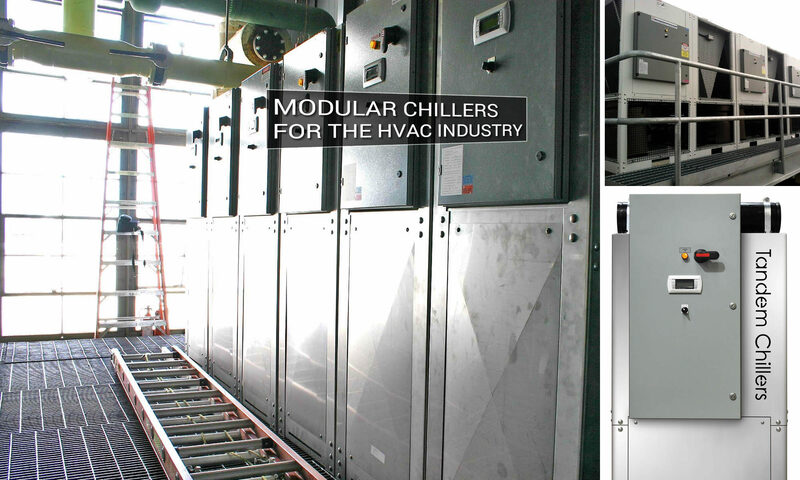 If you are looking for long term savings and reliability, high operating efficientcies, ease of operation and the best protection and preventive maintenance program on the market, this chiller is the answer. Models available: WX10, 15, 20, 30, 40, 50, 70, 75 and 85 with dual High Efficiency Scroll compressors. Standard Condensing Temperature Chillers up to 110° F leaving condenser water. High Temperature Heat Reclaim Chillers up to 145° F leaving condensing water. Dual Circuit Stainless Steel Brazed Plate Evaporator and Condensers. Stainless steel sch. 10 branch headers and main headers with grooved couplings. NEMA / EEMAC Type 4/12 Control Panel. Designed in compliance with CAN/CSA C22.2 No. 236-11 and UL 1995 4th edition 2005 Heating and Cooling Equipment. Evaporator and condenser certified to UL 207 7th edition and C22.2 no. 140-3-M1987. Models available: W060, 70, 80, 90, 110, 125, with a single High Efficiency Rotary Screw compressor. Single Circuit Stainless Steel Brazed Plate Evaporator and Condenser. If you have 70° F to 105° F building supply water (cooling tower water) to use for your condenser cooling, we offer high efficiency water cooled chillers. With our oversized brazed plate evaporators and condensers we can offer some of the highest EERs available today. Whether it is a matter of cooling an entire office complex, a data center, a laboratory or a hi-rise apartment complex, we have the expertise and equipment to meet any job requirements. 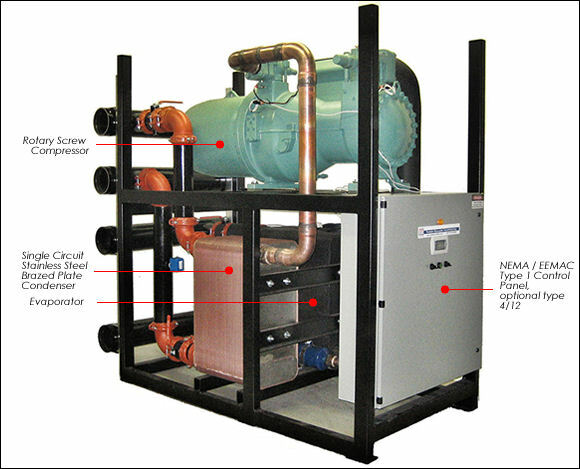 All our water cooled chillers feature either high efficiency “SCROLL” compressors with dual refrigeration circuits or single “SCREW” compressor with single refrigeration circuit, stainless steel copper braze plate evaporators, stainless steel copper braze plate condensers, our exclusive intelligent chiller control system, and a NEMA 1control panel with optional NEMA EEMAR Type 4/12.